The Magistrate Commission of the Idaho Fifth Judicial District is accepting applications for a judge appointment to replace Blaine County Magistrate Court Judge R. Ted Israel, whose retirement becomes effective Dec. 31. The deadline for submitting an application to Trial Court Administrator Linda Wright is 5 p.m. on Friday, July 18. 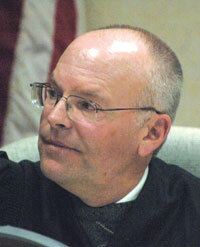 Israel, who has served as Blaine County Magistrate Judge for 10 years, announced his retirement in a March 3 letter to Idaho Supreme Court Chief Justice Roger S. Burdick. In the letter, Israel also accepted “senior judge status,” a designation that makes him eligible to preside on cases statewide as appointed by the Idaho Supreme Court. Israel, 57, was appointed to the Blaine County magistrate judge position in 2004, replacing Judge Robert J. Elgee upon Elgee’s appointment as the county’s district court judge. Israel earned a bachelor’s degree from the College of Idaho and a juris doctorate from the University of Denver. Before becoming a judge in Bannock County, Israel was a partner for nine years in the McDermott Law Firm in Pocatello. The announcement seeking applicants for Israel’s replacement states that the annual salary is $112,000 plus state benefits. Applicants are required to be at least 30 years of age, have practiced law for at least five years and to be licensed to practice law in Idaho.